When Integrity Resource Center began growing into other cities, we hired a part-time person to manage events. She did a great job, but I hadn’t yet put any systems in place for scheduled performance reviews. Two years later she took a different job. During her exit meeting, she shared that she wondered at times if she was measuring up, because she never received a formal performance review. My occasional affirming words weren’t enough. 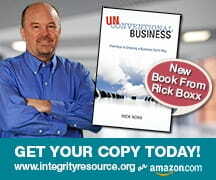 For many smaller organizations like Integrity Resource Center, systems are needed, but can be left undone, leaving people feeling unappreciated. If your organization is lacking important systems and processes, begin with establishing the ones that will help your people feel cherished.